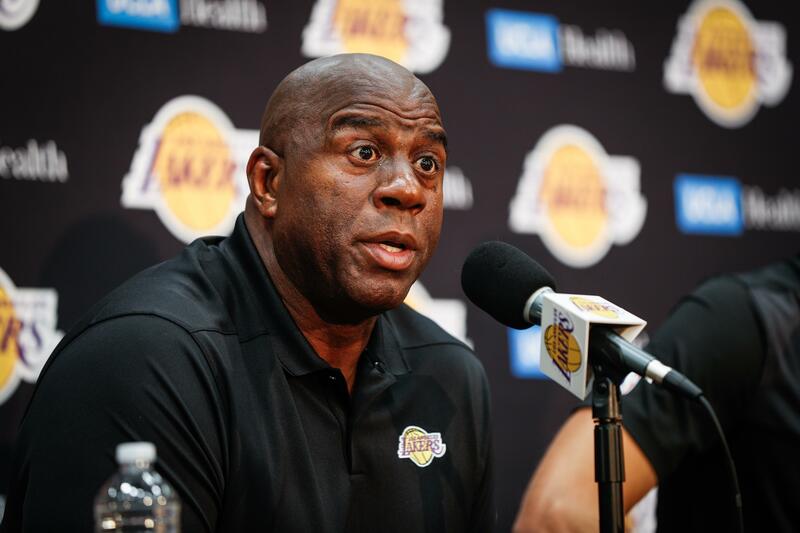 Magic Johnson was not apologetic about his talks with the New Orleans Pelicans becoming public after names of the players offered in order to sign Anthony Davis were revealed in the days leading up to the trade deadline. The Los Angeles Lakers were desperate to land the Pelicans power forward, who had put in a trade request, but the Pelicans stood their ground and decided they will wait until the summer before making a decision on Davis’ future. The Lakers are said to have made more than one offer and one of them is said to have included five players which included four from their regular starting lineup, namely Ivica Zubac, Kyle Kuzma, Brandon Ingram and Lonzo Ball and two draft picks for Davis, but the Pelicans were unmoved. The Lakers have not fared well since their win over the Warriors on Dec. 25 when they were in fourth place in the Western Conference. They have since dropped to 10th place while also missing LeBron James for 17 games with a groin injury during the same period. In the days leading up to the trade deadline, the Lakers suffered a humiliating 42-point defeat at the hands of Indiana Pacers. It was the worst loss suffered by a team led by James and the latter did it without their star player Vitor Oladipo. Many questioned if the loss brought about by the distraction of the looming trade deadline with a number of players being uncertain of their place in the team. Johnson, the Lakers’ president of basketball operations, urged the media not to treat the young players on the team like “babies”. He is certain that all the players are aware that being traded is part of the sport and they have to simply focus on the happening on the court. The Lakers recorded a stunning comeback win over the Boston Celtics on Thursday night but their inconsistent performances continued when they were beaten 143-120 by the Philadelphia 76ers on Sunday night. They remain in 10th place in the West, 2.5 games behind the eighth-placed Los Angeles Clippers.